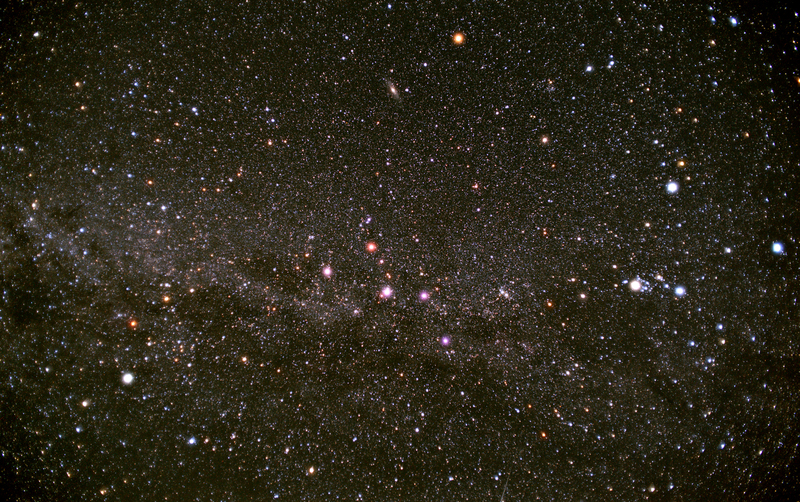 If a tracking mount was to be used to carry out some wide field imaging of the constellations, it is probable that the camera used would be one employed for normal photographic use. However, at some point, it might be worthwhile to purchase a camera which might improve on those already in hand. This article will look at the various cameras that might be bought and also the lenses that might be employed with them when astroimaging. The Compact System Cameras (CSC) and DSLR’s discussed can, of course, be used at the prime focus of a telescope with a suitable T-mount to fit into the telescope focuser. There are four sensor sizes that are most commonly used in CSCs and DSLRs. The smallest is the Micro Four Thirds (MFT) sensor found in cameras produced by Olympus and Panasonic. It has a sensor size of 17.3 x 13 mm and a crop factor of 2. This means that, in comparison to a full frame sensor (36 x 24 mm) the lens will have an effective focal length of twice its stated focal length. Thus a 20 mm lens on a MFT would give the same field of view (roughly, as the aspect ratio is different) as a 40 mm lens on a full frame camera. There are then two APS-C sensor sizes: that employed in Canon DX cameras has a size of 22.2 x 14.8 mm and a crop factor of 1.6 whilst that employed in Nikon DX cameras has a size of 23.6 x 15.6 mm and a crop factor of 1.5. Now becoming more common and somewhat less expensive, full frame (FX) DSLRs might also be used. The noise level in sensors has improved over the years and the table below gives a measure of the dark current noise produced in the sensors of several cameras. Each was evaluated from a 30 second dark frame taken at an ISO of 200. Due to, one assumes, to its smaller number of pixels the Olympus E-PL1 shows lower noise than the Panasonic GX1 − which proved a bit disappointing. 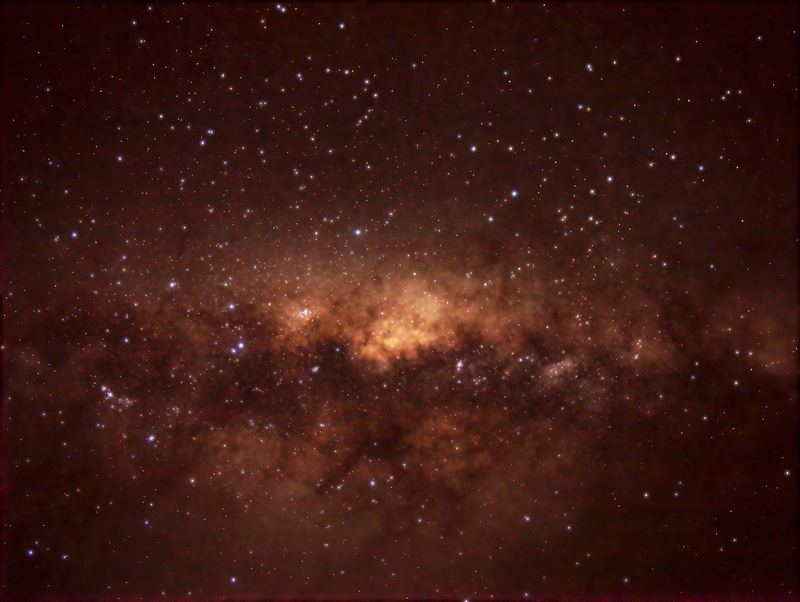 I have used both to produce images of the Southern Milky Way described in the digest and also discussed the GX1 it in the article about DSLRs and dark frames. It is pretty obvious that the MFT sensors are noisier than the APS-C sensors and that, despite having a high pixel count, the full frame D610 has very low noise. (Sony have been producing the superb sensors used in the Nikon (and their own Sony) cameras for some time. At the time of its introduction, the Sony sensor in the D7000 was regarded as the best APS-C sensor in production and I have used it to take many astrophotographs – the first being at the Isle of White Star Party also discussed in this digest. If a continuous sequence of frames is taken, the internal temperature of the camera will rise (in the case of the Canon 1100D) by ~12 Celsius. It seems reasonable to assume that the sensor temperature will rise by a similar amount. The dark current doubles for each 6 degree rise in temperature so will become 4 times greater over a time of ~1 hour. This doubles the noise in the frame being taken. In the ‘Art of Astrophotography’, I show how one can make a low cost ‘cool box’ to reduce the rise in sensor temperature. The use of such a cool box is impractical when used on a tracking mount, but I have tried the simple expedient of using two elastic bands to hold a small ice pack against the back of the camera (so close to the sensor) with some insulation placed over the outside of the ice pack. The result was quite encouraging with the camera’s internal temperature only increasing by 7 degrees Celsius rather than 12. I was somewhat surprised (and pleased) that it had then stabilized to 1 degree Celsius in ~24 minutes rather than ~54 minutes. Obviously cameras whose sensors warm up the least during the taking of a long sequence of exposures will be best. It is said that those cameras which employ internal image stabilization (by movement of the sensor) find it harder to take heat away from the sensor. This does seem logical and thus cameras without internal stabilization might perform better when taking continuous, long exposure, frames. Increasing the ISO of an image capture is a way of producing a brighter image when light levels are low. It does not make the sensor more sensitive instead, as the ISO is increased from its base ISO, often 100, the gain of the amplifiers reading the data out from the sensor is increased until an ISO of perhaps 800 or 1,600 is reached. The data being read into a raw file might then have 12 or 14 bits. If the maximum amplifier gain were 1,600, and the ISO is increased to 3,200 all that happens is that the numbers read out from the sensor are digitally multiplied by 2 so making the image apparently brighter. The bottom bit is thus always zero so there is one fewer bit defining the brightness level. At 6,400 the numbers are multiplied by 4 and there are 2 fewer bits, at 12,800 the numbers are multiplied by 8 and there are 3 fewer bits and so on. 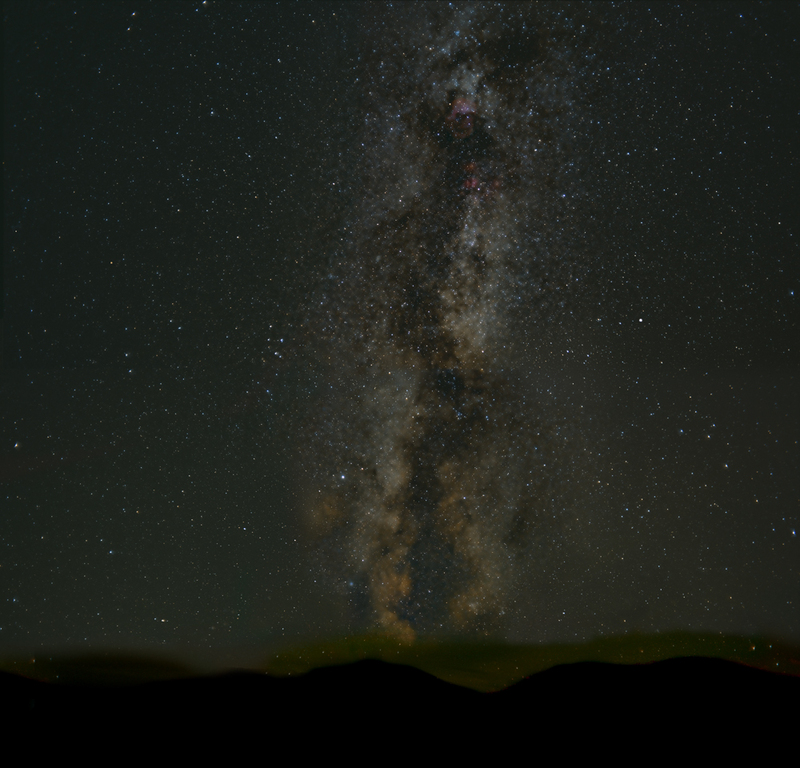 So with fewer bits to define each brightness level, the image is bound to get noisier. If one is capturing raw data (as one should) there is no point in increasing the ISO beyond the point where the amplifiers are operating at full gain. This is not an easy thing to find out but I always have always used an ISO of 800 when capturing images. [See further details on selecting the correct ISO in the digest article ‘What ISO to use for Astrophotography’] However, I may initially increase this to make it easier to align on the target area. Some of the latest sensors show an effect called ‘ISO invariance’ where the results are near identical if either a high ISO is used to produce a bright image or, instead, a low ISO used − initially giving a darker image − whose brightness is then increased in post processing. This technique may well give a wider overall dynamic range and I will try this with my Nikon D610. Apparently, for some time Nikon were said to have been carrying out some data manipulation on the raw files before they were being stored – so they were not really raw! It is said that this removed stars from the image and this is one reason why Canon cameras became pre-eminent for astrophotography. This is no longer the case and my Nikon D7000 certainly did not suffer from the problem so there is now no real need to choose Canon over Nikon. It is said that some Sony cameras also affect the images of fainter stars. 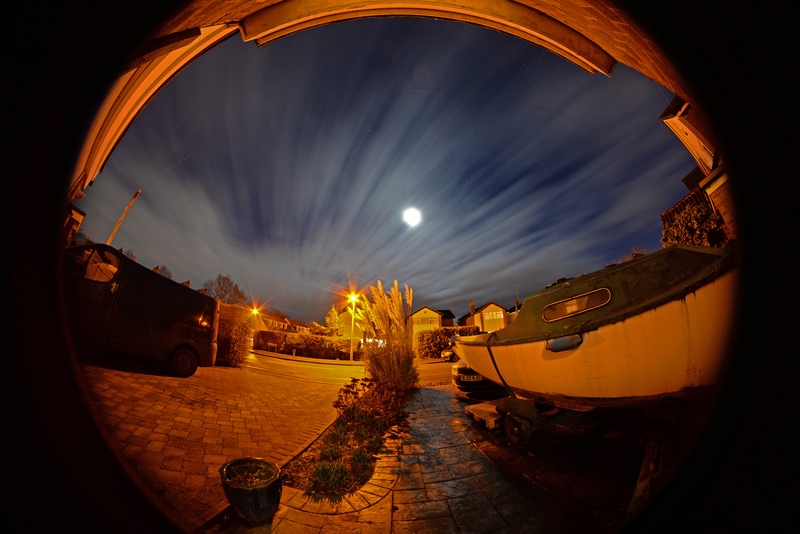 There seems to be much conflicting evidence in the astrophotography forums but it may only be when the ‘Bulb’ mode is used for exposures longer than 30 seconds. There is a very comprehensive article on this topic in the digest. For a beginner, here is some simple advice. If imaging on a cold winter night, just spend all the imaging time taking ‘light’ frames. Do not use the ‘in camera noise reduction’ feature. Do not worry about taking dark frames. If imaging on a warm summer night, use the ‘in camera noise reduction’ feature which takes individual dark frames which are applied to each ‘light’ frame in camera. Try the simple cooling method outlined above. When using a DSLR for imaging, it is very useful if the process can be carried out automatically. Essentially one needs an intervalometer to take a sequence of frames. These can be bought for many cameras for under £20 but it is important that the correct connecting cable is used. Laptops or tablets can be used with programs such as Astronomy Photography Tool and Backyard EOS for Canon cameras and Backyard Nikon for Nikon cameras. At low cost, I have downloaded DSLR dashboard for my Android tablet which can be used to control both Canon and Nikon cameras and also some Sony cameras. There were some problems using DSLR dashboard with my Sony A5000, but a free app called TimeLapse acts as an excellent intervalometer using wifi to link to the camera. Prime lenses are to be preferred as they usually have a wider aperture so enabling them to capture more light for a given exposure length. They will normally have far fewer elements which reduces scattering and helps improves contrast. It is usually best to stop the lens down a stop or two to both improve the corner sharpness of the images and also reduce vignetting (darkening) towards the edges and corners. Smaller and lighter than DSLRs, these have now a wide following and perhaps form the majority of Compact System Cameras. Cameras and lenses are produced by Panasonic and Olympus − the Olympus cameras having in-camera image stabilization. Lenses are interchangeable between the two. The only prime lens that I have acquired to date is the superb Panasonic 20 mm f/1.7 that I have taken with me to New Zealand to use on Olympus E-PL1 and Panasonic GX1 bodies to make a very lightweight astroimaging set up as described in the digest article ‘A Beautiful Southern Hemisphere Skyscape’. 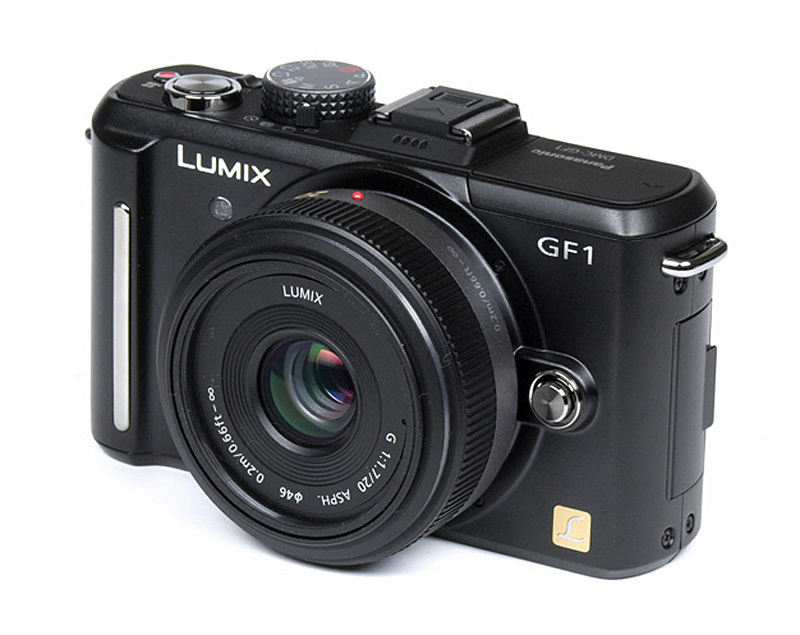 This has a 40 mm equivalent focal length and I am tempted to obtain the Panasonic 14mm f/2.5 Lumix G to give a 28 mm equivalent focal length. It has excellent performance even at full aperture. I also have a Photodiox adapter to enable me to mount my ‘Zeiss Contax G’ lenses of 28 and 45 mm focal length onto my MFT camera bodies. Adapters are available for around £30 to accept a wide range of lenses such as those designed for Canon and Nikon. Sony, whose superb sensors are found in Nikon DSLRs, produce a range of mirrorless cameras. In increasing cost these are: A5000 (20.1 megapixels), A5100, A6000, A6300 and A6500 with 24.3 megapixel sensors. Pleasingly all have tiltable rear screens which can make aligning on high elevation constellations easier and also, importantly, can allow a thin icepack to be placed close behind the sensor and so reduce its heating in summer nights. All include wi-fi and so an app or program such as qdslrdashboard or TimeLapse can be used to control them to take a sequence of frames to be stacked in, for example, Deep Sky Stacker. The cheapest, the A5000, and, I suspect, the A5100 do not allow the long exposure noise reduction the be turned off within their menus. (See discussion in the digest article ‘The use of Dark Frames when using a DSLR’.) However there is a way of turning it off. In Manual imaging mode, the ‘9 o’clock point on the rotary dial should be depressed which brings up a ‘Drive Mode’ menu on the left of the screen. If the bottom of the dial then clicked the various possibilities are scrolled through until ‘BRK C 0.3ev’ is highlighted. This mode is then selected by pressing the button in the centre of the dial. The camera then no longer applies the long exposure noise reduction. Later Sony cameras such as the A6000 series do however allow it to be switched off within their menus. If I were to purchase a new Sony mirrorless camera, I suspect that I would go for the A6000 at ~£500. I do, however, have a low cost, second hand A5000 whose image quality is excellent and these can be still be bought new for ~£250. From around £30 adapters can be purchased to allow, say, Nikon or Canon prime lenses to be used with them. It might surprise one to know that there have been three such cameras specifically aimed at astrophotographers. Let me explain why. Camera sensors are sensitive to infrared radiation (IR) which comes to a different focus to white light and, if allowed to fall on the sensor, would give haloes around bright points of light. To prevent this, a filter is placed in front of the sensor to prevent the passage of IR. However, to give an image that equates to that which would be seen by eye, this filter has a very gentle cut off across the red part of the visible spectrum. This has the unfortunate effect of reducing the brightness of H-alpha regions that emit in the deep red part of the spectrum to about 25%. 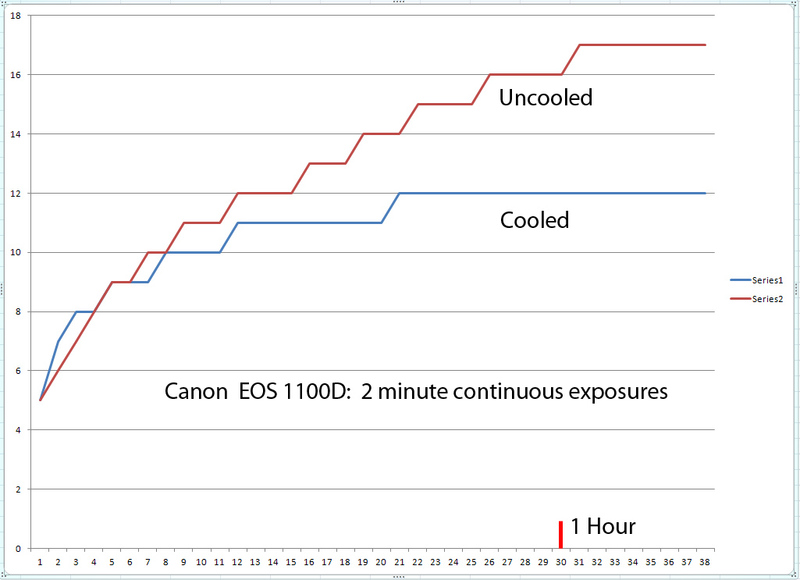 Both Canon (EOS 20Da and 60Da) and Nikon (D810A) have in the past produced cameras modified to allow ~75% of the H-alpha emission to pass through. At a cost of over £2,500 it is still possible (Feb 2018) to purchase a new Nikon D810a camera and it sometimes possible to acquire second-hand versions of both. A far lower cost route to an H-alpha enhanced camera is to purchase one that has been modified (or to have your own camera modified) to replace the original filter with one that has ~98% transmission at the H-alpha wavelength. These would give a reddish cast to any normal images taken with them, but using a custom white balance, they can still be used for day to day photography. It should be said that the latest cameras (Canon 7D Mark II and Nikon D7500) with very low noise sensors can actually produce excellent images which include H-alpha emission without any modification. Recommended cameras now available are: Nikon D7500, D7200 and D500, Canon EOS 80D, EOS 760D and EOS 200D and Sony Alpha 77 ii. Buying second hand, I think any Nikon camera from the D7000 onwards and a very wide range of Canon cameras would be suitable for astroimaging. Reading the reviews of these and earlier cameras, it is apparent that for some time that the Sony sensors in Nikon and Sony camera bodies had a higher performance than those in Canon cameras, particularly in terms of dynamic range which is the result of Sony sensors having very low inherent noise, an important factor in their use for Astrophotography. It is pleasing to say that the latest Canon sensors, such as that in the EOS 80D, have pretty much bridged the gap that existed for a while. 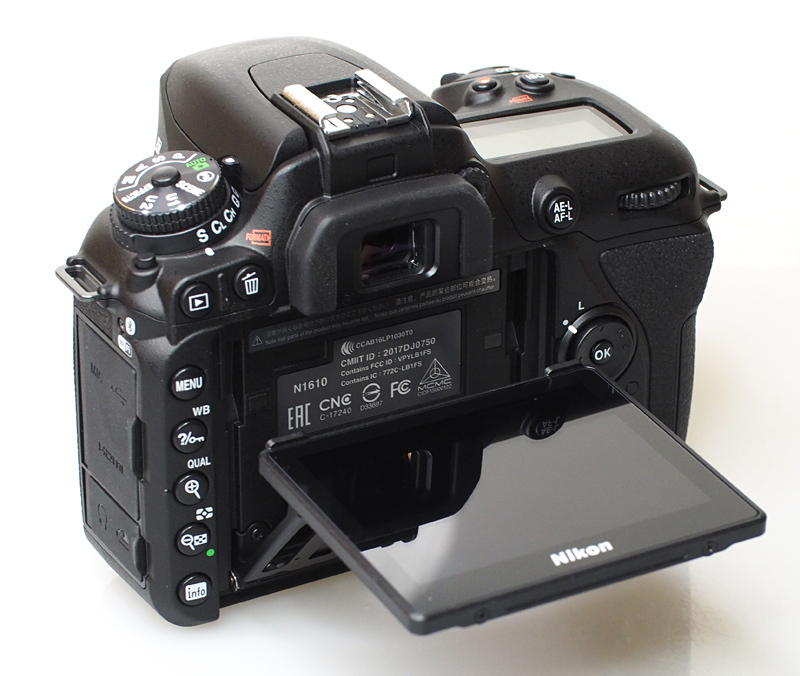 A good feature to have, present in the D7500 for example, is a moveable rear screen. It can be a very great help in framing a region of sky near the zenith. (For stability, I like to use a tripod with as short legs as possible. Lying on one’s back to view a fixed screen is not the easiest of activities!) With the screen out, it will also reduce the thermal path from the back of the sensor to the outside and so reduce the increase in the sensor temperature when a long sequence of time exposures are made. 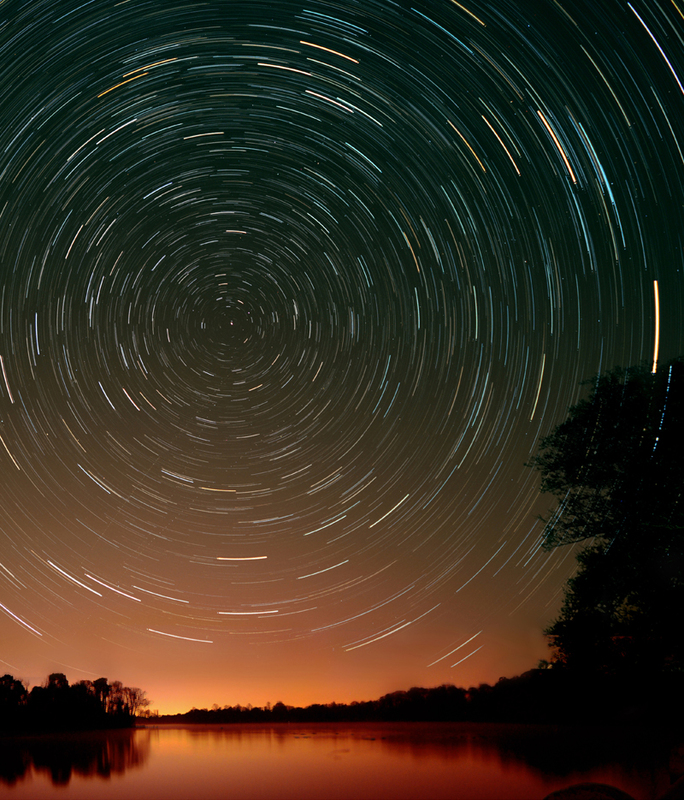 I have suggested above that one should use prime lenses for astrophotography, but one of my best images was taken with the Sigma 10-20 mm f/4-f/5.6 zoom lens to give a really wide angle view to capture star trails. 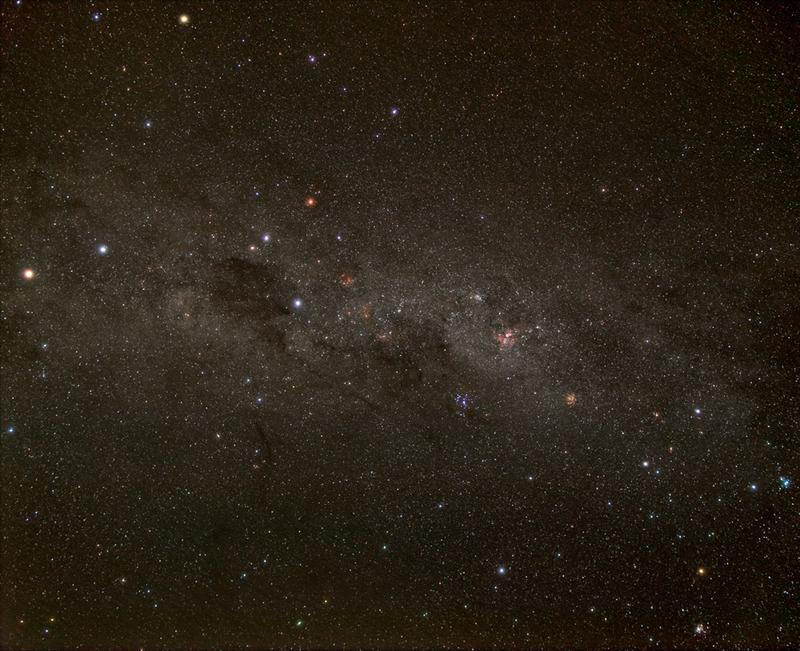 Set at 10 mm focal length (so 15 mm equivalent on a Nikon APS-C DSLR) it has a diagonal field of view of 109 degrees. This is likely to be an expensive option, but perhaps not so bad if you have some prime lenses from film days. The two least expensive options for a new full frame camera are the Nikon D610 and the Canon EOS 6D. Both are said to be excellent for astroimaging use and cost new around £900 but I have seen some internet sales of new bodies from around £750. Interestingly, theses prices are not too dissimilar than the top of the range APS-C cameras – food for thought? Camera Jungle and mpd.com sell used versions at a good discount and, given a reasonably low shutter count, these can be an excellent buy. Mint versions of the 6D are around £800 and the D610 around £845. You might also consider a second hand Nikon D600 which has the same sensor as the D610 and is almost identical. It suffered from some shutter problems which required the sensor to be cleaned but apparently these problems ceased after around 5,000 frames had been taken and I have seen them for ~£650 second hand. If the budget is not a problem, then there are a number of well reviewed lenses for both Canon and Nikon Cameras. Sigma provide some outstanding ‘Art’ lenses covering a wide range of focal lengths. The 24 mm and 50 mm f1.4 lenses are highly reviewed. At far lower cost you may be able to find some Tamron Adaptall-2 lenses which, with a suitable adapter, could fit either make of camera. I have their 24, 28 and 90 mm (a classic) prime lenses all of which are good. Both cameras makes also provide a range of new prime lenses. As a past Nikon Film user, I have quite a number of manual prime Nikon lenses: a 28 mm f/3.5, 50 mm f/1.8, the very sharp 55 mm, f/2.8, Micro Nikkor, 200 mm, f/4 and 300 mm, f4/5. For astrophotography use, manual focus is fine. An interesting lens, the Samyang 8 mm, f/3.5, though designed for APS-C cameras and described above, can be used to give an even wider field of view on a full frame camera provided the lens hood is removed. Even though modern cameras have higher pixel counts, so meaning that the area of each pixel is less and hence, one might think, less sensitive, it appears that improvements in sensor technology seem to have largely negated this thought. Though for some years the sensors in Sony cameras and Nikon cameras from around the time of the D7000 were better than those in Canon cameras there is no longer any significant difference. Nikon no longer ‘massage’ the raw files which made them unsuitable for astrophotography. The latest sensors have so little noise that the H-alpha emission can be brought out without requiring an IR filter modification. For a lightweight camera to take to dark sky sites then one of the Sony series such as the A5000 (still available at low cost and which can, as described above, take long exposures without long exposure noise reduction employed) and A5100.